PREPARATION: Cover work area with paper or plastic drop cloth. 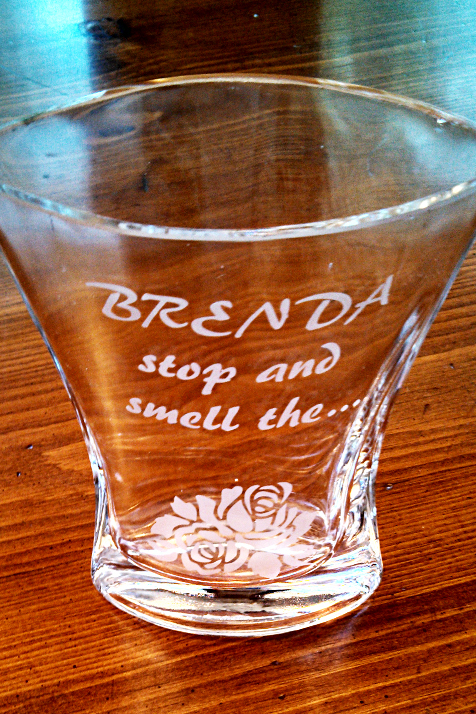 Clean the surface to be etched with water or alcohol. (Not glass cleaner, which might leave residue!) Dry with a lint free cloth or coffee filter. 1. Peel the release paper on the back of the vinyl to expose an inch or so of the adhesive. Align and carefully adhere the exposed adhesive to the glass using a squeegee. Continue peeling back more and more of the stencil, squeegeeing it down piece by piece so that it is smooth and free of air bubbles. 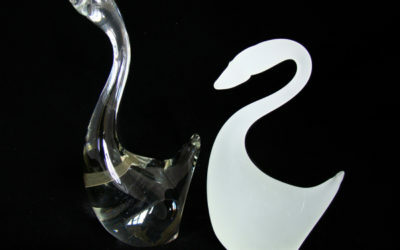  Measure and mark the glass with a marker or grease pencil to make sure your stencil is properly aligned and centered. 2. 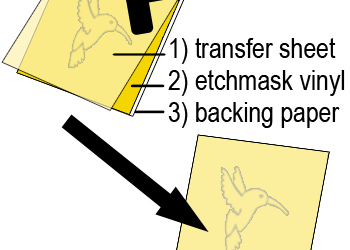 Carefully, remove the transfer sheet from the face of the stencil. 3. 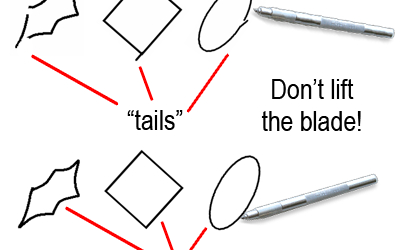 Use the etchall® detail pick knife to pick out each section of the pattern.  Do not attempt to pick sections from the lines as this can distort the edges of the pattern. Instead, pierce the center of a section and slowly peel it out towards the line. 4. Once all pieces are removed, place the release paper on top of the design and rub down with the squeegee. Check for any small patches of adhesive that may remain on the exposed glass and rub them off with your finger. 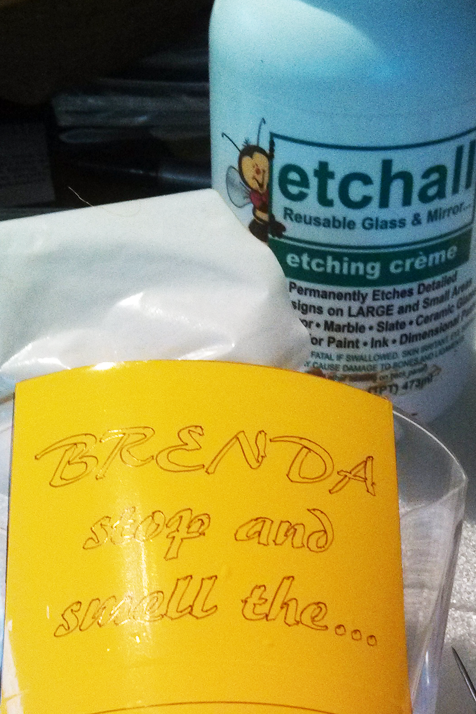 WARNING: etchall® etching crème will permanently etch any glazed surface! Avoid letting crème come in contact with porcelain sinks or ceramic tiles. IMMEDIATELY wipe accidental spillage with wet towel or sponge. 5. 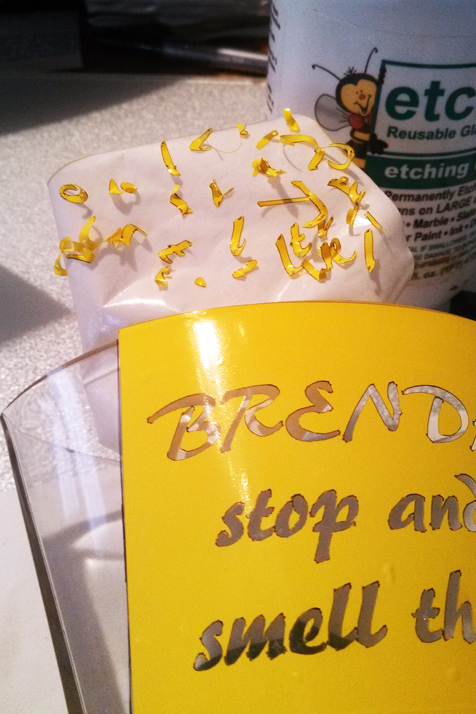 Make sure that all areas not to be etched are covered with vinyl, tape, or contact paper. On a rounded surface, cover the edges of the stencil with extra vinyl to form a “well” to keep crème in place. 6. 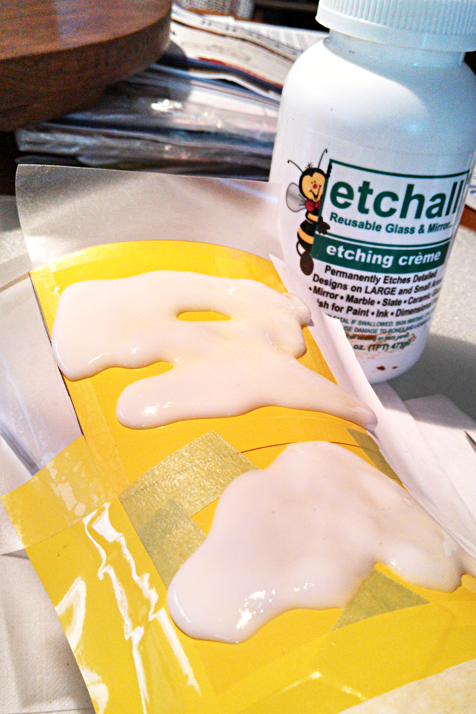 Apply a heavy coat of etchall® etching crème. ️ DO NOT use a brush – brushes may not distribute the crème evenly or thick enough and can cause streaking.  DO NOT pour etching crème directly onto the exposed glass. Instead, use the squeegee to pull the crème over the entire area to be etched evenly all at once, as if icing a cake.  RULE OF THUMB: You can never use too much! 7. Leave etching crème on design for 15 minutes. After etching time has elapsed, use the squeegee to return the crème back into the original container for later re-use. 8. Rinse etched surface with hot water to remove any remaining crème.  Remember to keep crème away from porcelain sinks or ceramic tiles! 9. After all crème has been thoroughly rinsed away, remove the stencil under the hot running water and discard. 10. Wash and dry. You now have a beautiful even etch!